"I am so pleased that the Book Chick has asked me to write about my favorite procrastination tools. Like many writers, I will do just about anything to avoid writing, and it is only fair that I should share some of the techniques I have perfected over the years. I would have had this column in sooner, but – you know. Drinking tea: Tea is ideal because there are so many steps: boiling, steeping, sweetening. When I get too hopped up on caffeine, I switch to LaCroix sodas. These are basically just flavored seltzer, so they have the benefit of no calories. They also have the benefit of being stored in my outside refrigerator. Eating chips: In the salt vs. sugar wars, I’ve always come down on the side of sugar, but whenever I get stuck in a manuscript, I need chips of some kind: Doritos, pita chips, plain tortilla strips. I like the sting of salt on my tongue. I also like that I can get just a few chips at a time … over and over again. During Girl Scout cookie season, I switch to thin mints. Cats: I have two, both quite demanding. They need food, water, love. They need to go out. Then come in. Then go out again. Sometimes they throw up, and I need to stop what I’m doing to clean it up. Just so we’re clear: I would much rather write than deal with cat vomit, so I don’t recommend that as a procrastination technique. Checking email: Hey, you never know when something just can’t wait. It would be irresponsible to close out my Outlook folder. Facebook: I just reposted a link of a squirrel running through an obstacle course to the “Mission Impossible” theme song. My friends will thank me. Other websites: I invest four hours every week in watching American Idol. I owe it to myself to read Television Without Pity’s weecaps. And then there are all those career-related sites: book blogs, Amazon, Barnes & Noble, GoodReads. And what about those Yahoo headlines? Do you really expect me to pass by a news story entitled “A Rabbit Rescue in L.A.”? In my defense, there are certain procrastination methods that I have managed to avoid, no matter how tempting. These include exercise, paperwork, and cleaning of any kind. I have my standards." 1. In a comment, tell me what your favourite method of procrastination is when you don't want to do something. Please include your e-mail address with your comment so that I can contact you if you win. No e-mail=no entry!! 2. *Bonus Entry* Become a follower of this blog through Google Friend Connect and leave me a seperate comment letting me know that you follow. Current followers are eligible as well, just leave a seperate comment letting me know that you already follow. 3. *Bonus Entry* Spread the word about this contest in any way that you wish. Twitter about it, blog about it, post it on your sidebar, whatever. Just leave me a seperate comment letting me know how you did it. This contest runs until midnight on April 30, 2010. It is open to both Canadian and US residents, and winners will be contacted by e-mail. Good luck! My best procrastination techniques: looking something up on the internet, tidying my desk, going to get the newspaper (a 5 minute walk. I can easily turn it into a 15 minute task by just looking around our 3-acre lot), unloading the dishwasher, sorting some books into different piles. Your blog is in my Google Reader. I can't say I have a technique. I just don't do some things when I should. Procrastination is a choice. Ironically, my favourite procrastination method is to well... organize something else. Clean the closets, lable something, alphabetize something... This way I can say I am busy and getting something done, just not the something I really need to do! Please accept this as my entry. Thank you! ahh . . . procrastination - I have been practicing it for most of my life! A favorite these days is checking my reader and blogs - I can lose hours doing that! I would love to win this book - leenbeen2001 (at) yahoo (dot) com. I follow your blog in my google reader and follow publicly via friend connect. I play on the internet...look up any useless trivia! I am now a follower of your blog via google friend connect! The Internet is my biggest procrastination tool. Hmm...read. Or hop online and check out my favorite blogs...which ends up eating away a few hours. I surf the web and read blogs! Much more fun! My fave way of procrastinating is to surf the 'net -- always available & endless opportunties. I go online or read to procrastinate. Usually it is to avoid doing laundry. My favourite tools of procrastination are to hit the snooze button, play on the internet, and to talk on the phone. 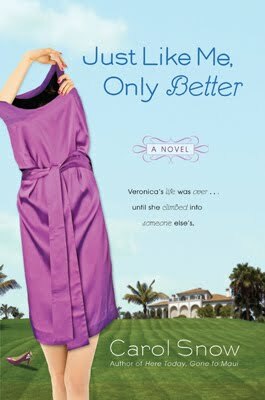 And I would love to read that book 'Just like me Only better'.